Because of Kent from Pencilog I got to know Arnie, the guy behind Banditapple, and because of Arnie I got to know Eun Suk Bang, the designer behind ToBe Story. I really love the Banditapple carnets, I must have used them for more than five years now (just because my first review of them was a bit more than five years ago) and together with Atoma they are definitely one of my two favourite notebooks. Banditapple has the better paper, Atoma is more practical in terms of reorganising/reshuffling things around within the notebook. 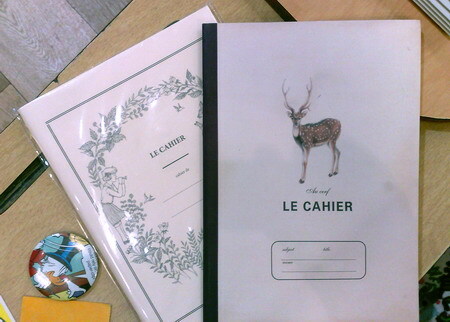 My recent Lamy Line Friends and Banditapple carnet order also included two items from Eun Suk. One of them was the “wooden board”, being described as a little table to write on. The idea came from the fact the carnets are made from a tree, as should the surface be you put them on. The wooden board is not only designed by her, she is also making them herself. Each board takes three to five days to manufacture, which involves cutting beech plywood with a CNC machine as well as applying three oil coatings before they get to dry. 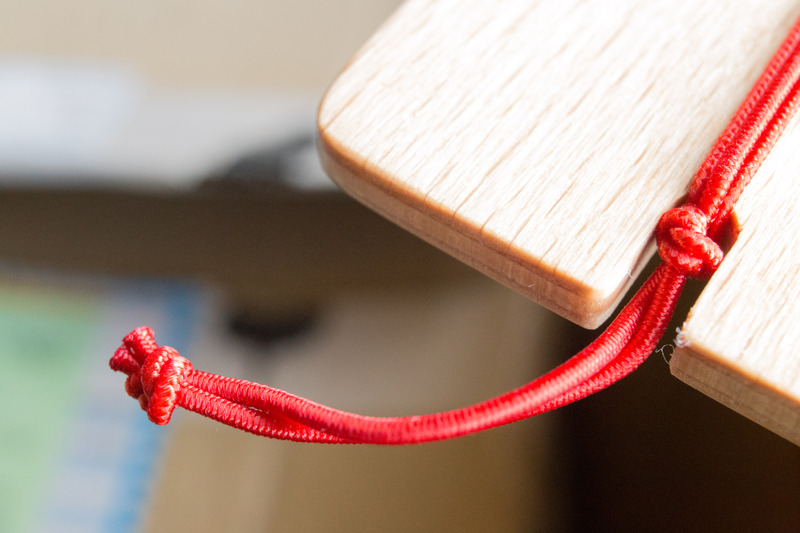 They were sold in May this year as the Banditapple carnet x ToBe: wooden board. The price was $15. It was one of a number of side projects Banditapple was taking part in, all with low numbers of items being handmade and all of the items sold out very fast. There’s a good chance the wooden board will be available again if there is enough demand. If have used the board many times when I needed a surface to write on and when the board was nearby. It was always very hand. 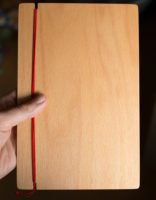 There are three strings, so you can attach three notebooks if you want, but I usually just used it as a surface to write on. Despite my admiration for the simple beauty of this board I have to say that there are also drawbacks, mainly that I haven’t figured out whether there’s an easy way of writing on the left pages of your notebooks if you use the wooden board as a clipboard and that the wooden board is only useful is you have it with you, but for practical reasons you usually wouldn’t have the board with you when you need it, unless you use it as a stationary notebook holder / organiser. In any case, it is a beautiful board! Just a reminder, since I changed the WordPress Theme a few months ago most images are available in high resolution. Open them in a new tab for the hires version. You can read more Banditapple related posts here. The Well-Appointed Desk has reviewed them, too. You can read more about the John Lewis pencil used in the last photo in this blog post. 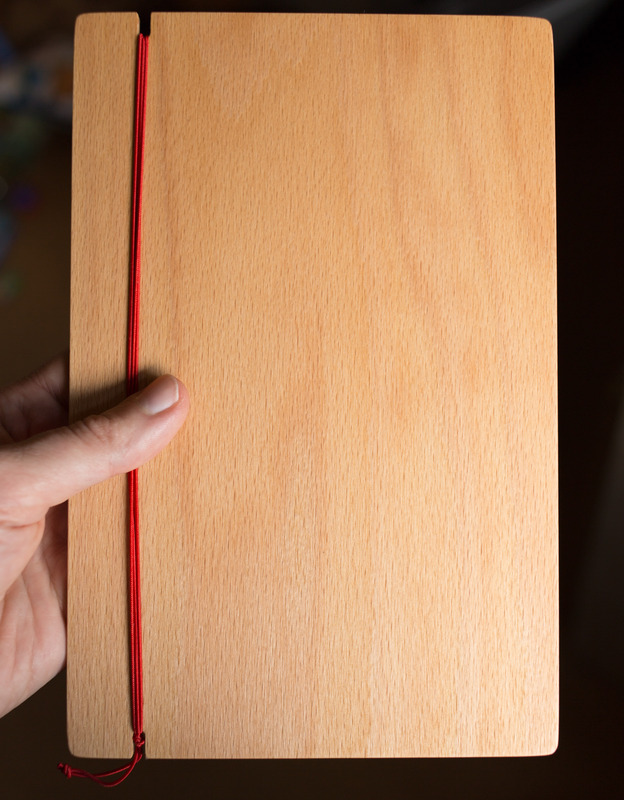 You can read more about the Noris colour used in the last photo in this blog post. 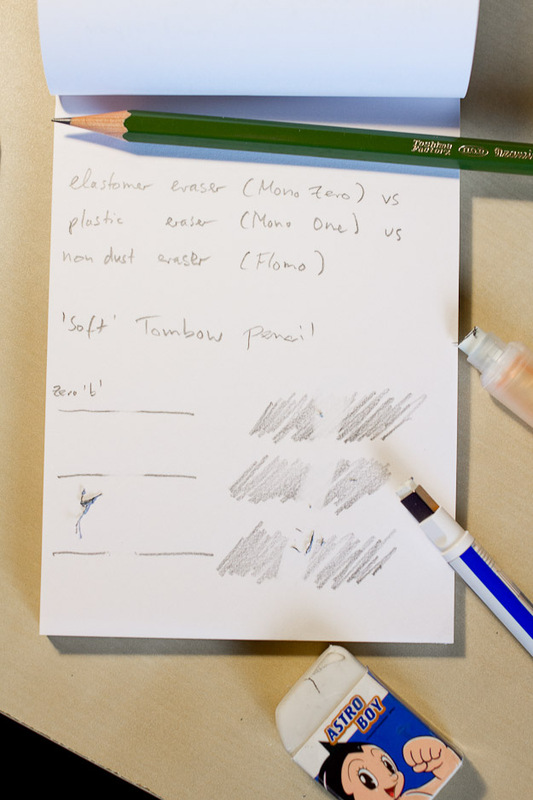 Today: a comparison of different Tombow erasers – the Tombow Mono Zero, available either with a 2.3 mm round tip or broad 2.5 mm * 5 mm rectangular tip, and the Tombow Mono One, an eraser that looks as if it’s supposed to be used on a keyring or as a charm. I wrote this blog post originally for The Pen Company who send me these two erasers free of charge. The Mono Zero was originally released on 12 November 2007 and since its release it has won the iF product design award 2010 and the red dot design award 2010. It has also received Japan’s eco mark certification because of its high content of (pre-consumer) recycled plastic. The body of the eraser is made in Japan, while the eraser core itself is made in Korea. The Mono Zero has been designed by Ms. Chisato Takahashi, who is also responsible for the Mono smart. I got mine as a free sample from The Pen Company where the current retail price is £3.47. The Mono Zero is available either with a 2.3 mm round tip or broad 2.5 mm * 5 mm rectangular tip and each of these versions is available in either a black body or a black, white and blue body. There used to be a silver version as well, which – to me – always used to be by far the least attractive looking version. This silver version does not seem to be available anymore. The eraser itself does not fill the whole body. This might come as a surprise when you have used other pen shaped erasers that come in a plastic body, but is not not really a problem. You do get slightly less eraser for your money, but the whole eraser (body plus eraser) itself is not expensive and the eraser core will still last a long time. Just to mention is explicitely, there are also refills available for these erasers, like for most pen shaped erasers. Labelled as an elastomer eraser, the Mono Zero contains an eraser made from ethylene propylene copolymer. When I received the eraser I did try it out and compared it to my favourite kind of eraser, a dust-free or non-dust eraser (as long as it’s a dust-free eraser I usually like it very much). It’s probably not fair to compare it to my favourite type of eraser, or let’s say not objective – others might not like dust-free erasers, but then this comparison is a valid approach as I am writing about what I like or dislike about the Mono Zero. For the pencil to be erased by the Mono Zero – I originally thought what better match could there be for the Tombow Mono erasers than a Tombow pencil, so I picked last year’s 100th anniversary special pencil. To my surprise the two Tombow products, pencil and eraser, didn’t seem to be able to cooperate that well with each other. This was due to the fact that the Tombow pencil is very soft. According to Pencils and other things the 100th anniversary edition has the same lead as the current Mono 100, but my 100th anniversary pencil seems much softer (and smudges easier) than a Mono 100 (both HB). I am not sure whether I’m imagining things here, or I just happened to have a softer than usual 100th anniversary pencil and a harder than usual Mono 100, or whether the lead is the same, but there’s actually a shift in grade (e.g. 100th anniversary HB = Mono 100 B). In any case, the Mono Zero was not able to eraser a strong line, i.e. drawn with some pressure, without a trace. 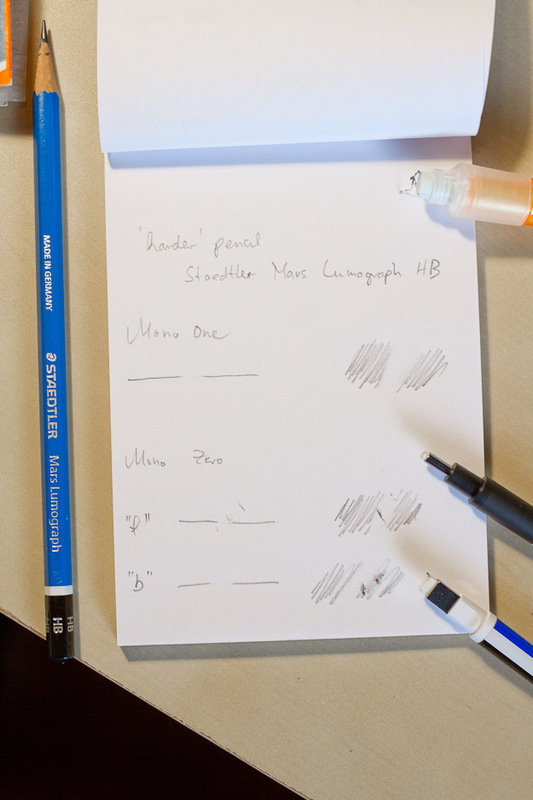 It did however manage to eraser strong lines of harder pencils, in this case a Staedtler Mars Lumograph in HB, without a trace. My impression of the Mono Zero was that it’s not the greatest performer when it comes to actual erasing (worse than a non-dust / dust-free eraser), but its strong point is precise erasing …because of the tip size and shape (a bit like a Kokuyo eraser). When I was looking for other blog posts to mention in this review I rediscovered Dave’s review of the Mono Zero, which came to the same conclusion regarding eraser performance. A great eraser, because its fine ‘tip’ allows precise erasing, even though eraser performance itself could be better. The Mono One, designed by Mr Kazunori Katami, who holds a lot of stationery patents, was released slightly earlier than the Mono Zero – on 5 February 2007. The Pen Company is selling this eraser for £2.60. The body of this eraser is also produced in Japan (no eco mark certification for the Mono One, though), while the eraser itself is made in in Vietnam. Labelled as a plastic eraser, the eraser is made from thermoplastic elastomers. Despite the different materials, performance seemed pretty similar between the Mono Zero and the Mono One, with the Mono One maybe performing a little bit better. 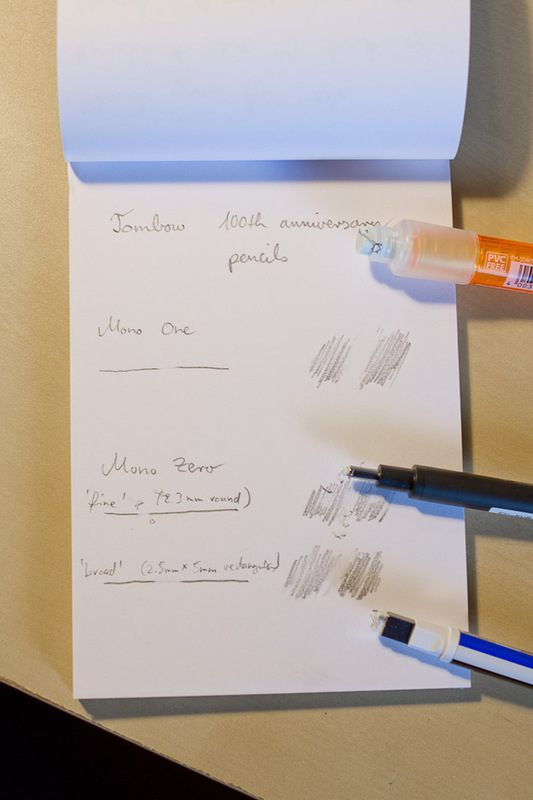 The Mono One does not offer as precise erasing as the Mono Zero, the tip is bigger, but it is a nice size, which makes it a great eraser to carry in a pencil case bag or, possibly even on your key ring. I would like to thank The Pen Company for these erasers, I got them as free samples, and Mrs. Balsewicz from Tombow Europe for all the information she has given me about these erasers. I would like thank Sean for the Tombow 100th anniversary pencils. Back from Germany, I am going to try another four-in-one blog post. I did not take part in the Faber-Castell factory tour mentioned in one of the previous comments because of a bereavement – which resulted in a very different trip than planned. I hope to take part in one of their factory tours in December and hope to find the time to visit Staedtler’s shop in Nuremberg, too. …but today another (the last?) many-in-one blog post. The Kronenheft must be one of the most understated notepads available. I bought mine at Antiquariat Daniel Osthoff in August 2010. I mentioned this shop and some of the papers they sell in my blog post about the OHTO Super Clip. 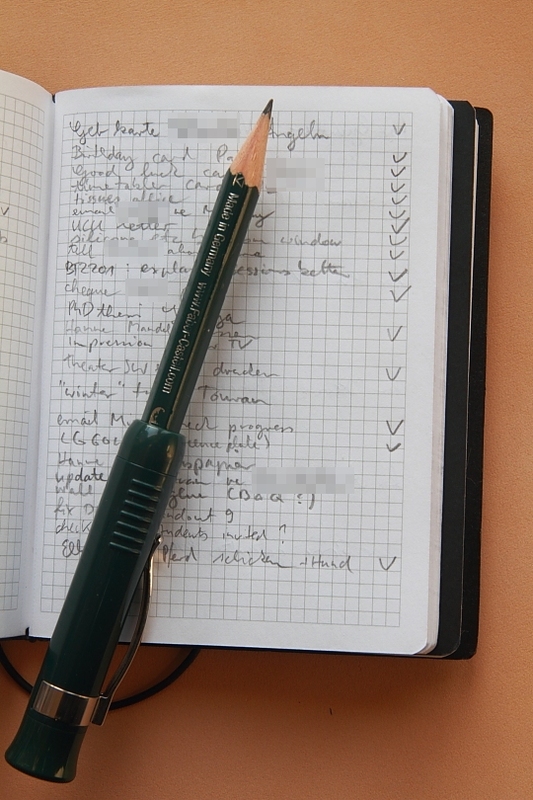 The Kronenheft notepad has been on the market for many years and is distributed by Carta Pura. 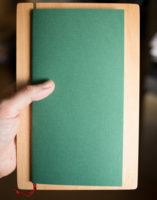 It measures 15 cm x 10 cm and features a 290 g/m² Preßspanersatzkarton cover, an “imitation particle board” traditionally used, amongst other things, for book covers. It is a sturdy material made from wood pulp. 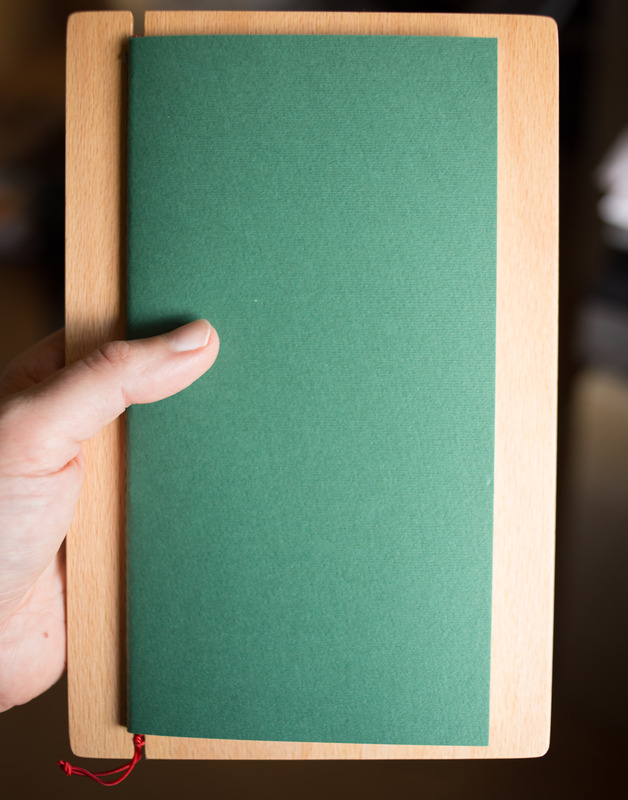 The paper of this pad is 80 g/m² Salzer Werkdruck paper from Austrian paper manufacturer Salzer. Even though paper has been manufactured in Salzer’s town since 1469 and at the their mill, Obere Papiermühle, since 1579, the history of Salzer is slightly younger as the founder Kaspar Salzer did not have his own paper mill until 1798. Even though the 80 g/m² Salzer Werkdruck paper is not their best paper it is very good with a great feel and texture and a slightly creme-coloured tint. 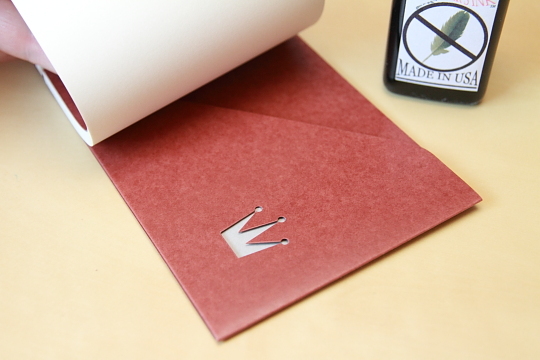 Carta Pura, the distributor, sells this notepad in twelve different colours for € 7 each. You can also get a refill (40 sheets) for € 3. I paid less, but I am not sure how much exactly. FontShop used to sell them for a good price, but when I check recently I could not find it in their online shop any more. This is the second appearance of a Morning Glory pencil at Bleistift. The first appearance was last month, when I wrote about RAD AND HUNGRY’s STMT X Korea kit. This time I used a much older Morning Glory pencil that my wife bought about ten years ago, the morning glory No. 33322-45229 HB. You would think that such a long product number can definitely point to one specific type of pencil, but there are actually different versions of the morning glory No. 33322-45229 HB pencil, with different colours printed on the pencil, but with the same product number. The pencil itself writes very well. It could be a bit smoother, but it is by no means a scratchy pencil. Since today is Star Wars day (May the Fourth be with you) I have to include the Pelikan M100, too. I cannot look at this pen without thinking of Stormtroopers and am convinced that if Stormtroopers had fountain pens this Pelikan M100 would be standard issue! 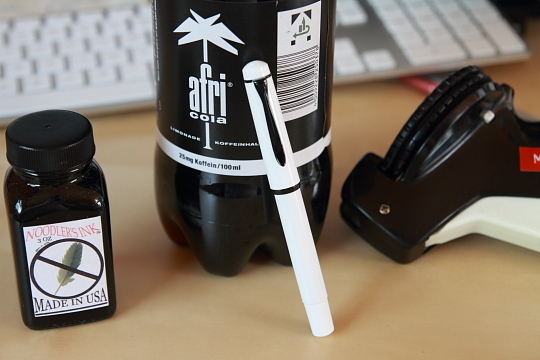 It is a great fountain pen and all of its parts are either white or black, even the nib is black. 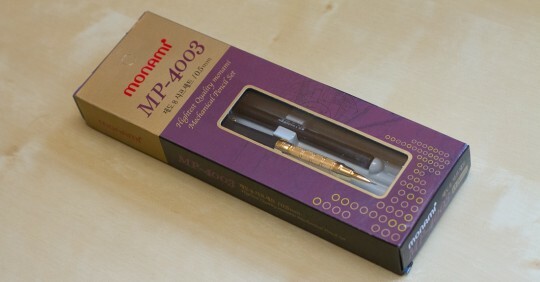 The piston mechanism does not feel as smooth as it does with a Pelikan M200 or a Souverän, but when this fountain pen was released in 1987 it was not an expensive pen so it is no surprise that the piston mechanism is not on the same level. The nib however is excellent for a steel nib and is quite flexible, too. If Stormtroopers had fountain pens this Pelikan M100 would be standard issue. Here you can see the M100 camouflaged between other black and white items. 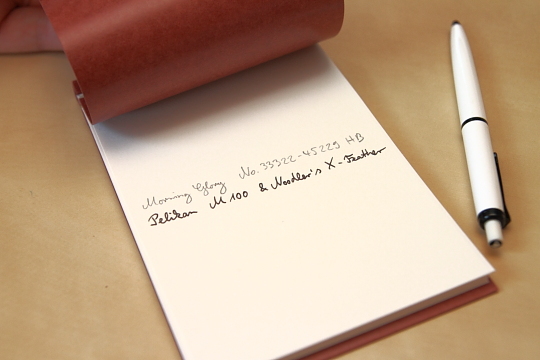 The ink used in the M100 is Noodler’s X-Feather ink, a black ink that is bulletproof, i.e. resistant to bleach, chemicals, light, etc. I have used this ink for years and am very happy with it. There is only one disadvantage I noticed. If you use it in a wet writer and use paper that does not absorb ink easily (e.g. post cards) it can happen that a layer on top of the ink does not ‘dry’ completely. In this case it can smudge or smear, even days after the text has been written. Under normal circumstances this is however not really a problem. The Kronenheft is just great, but with its price tag I am not sure I will use it often. It copes well with ink (no bleeding though) and pencil and has a nice colour and texture. You can find another photo of the Kronenheft in my previous blog post Wooden Letter Rack with Draw. You can find English blog posts about Carta Pura at bloesem travel and at snowflakes & blackvampires. 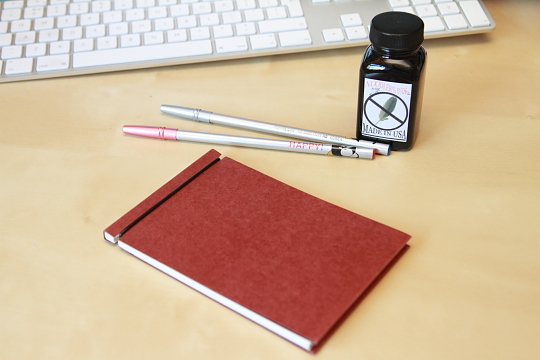 Noodler’s X-Feather ink has also been used in my previous blog post Carrefour Bloc-notes. I’d like to thank Ms Schwamborn from Carta Pura for additional information about the Kronenheft. In case you wonder where my Cherry G80-3000LSC went: the photos show my wife’s desk, which is very similar – except the keyboard. A few weeks ago I wrote about the Eco Bridge Paper Pencils. I want to mention a few other things that are being sold in the same shop sell. The items are not exactly cheap, so it is unlikely that I will buy them. This means I cannot write a proper review, but it would be a shame to leave these items unmentioned, as they are unusual and, for lack of a better word, interesting. If I had to describe the shop I would say it is a shop full of random quirky things aimed at arty, Apple using yuppies. Things are not cheap, but it will be difficult to find them somewhere else. It is a kind of hip and cool version of Manufactum. Continuing from the Eco Bridge Paper Pencils, along the Korean stationery theme, they also sell Korean ‘notebooks’ (actually what I would call exercise books). They look nice and are labelled in French. Unfortunately importing them from Korea made them cost five to ten times the price of a similar (plain looking) notebook from Europe. 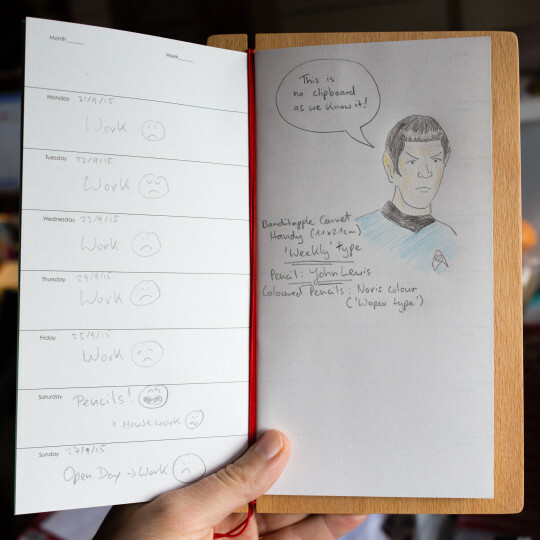 If you want a really nice, thin notebook this might be it. Another product imported from East Asia is a set of 36 squary, coloured pencils from Japan. 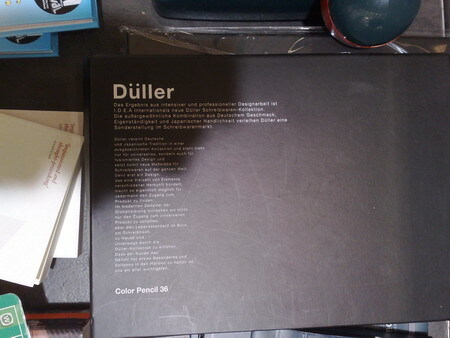 It retails for £60 and is part of the Düller range. The Düller range also includes a pen designed by Dietrich Lubs, who is featured in New York’s Museum of Modern Art. 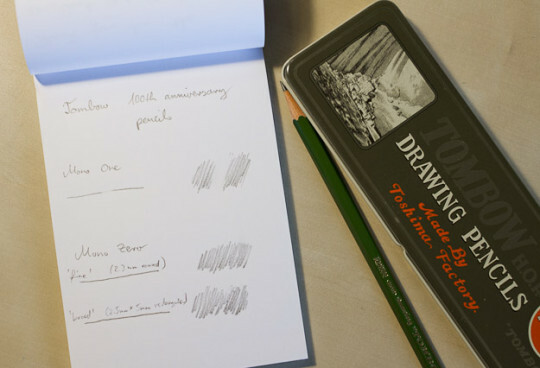 The coloured pencil set is designed by Naori Miyazaki. Unfortunately I was not able to find out more about her1, except that she is not featured in the Museum of Modern Art. The MoMA online shop does however sell a clock designed by her. Back to the pencil set. There is some rather strange text in German written on this pencil box about combining German taste and Japanese handiness, which looks instantly East Asian because of the character spacing. In different online stores in the UK and Australia the price of this pencil set can vary dramatically. I thought I saw it in an American online store for $96, but I was not able to find it any more to confirm this price. Also for sale are fairly big animal shaped erasers and Penguin pencils. You can find more information about the Penguin pencils at penciltalk. The Lamy 2000 and other products by its designer can also be found in the Museum of Modern Art.